fog. flight. and true fables. This is a wonderful image Karen. I like it very much. 6 & 7 flying/swimming in fleece…entrancing. 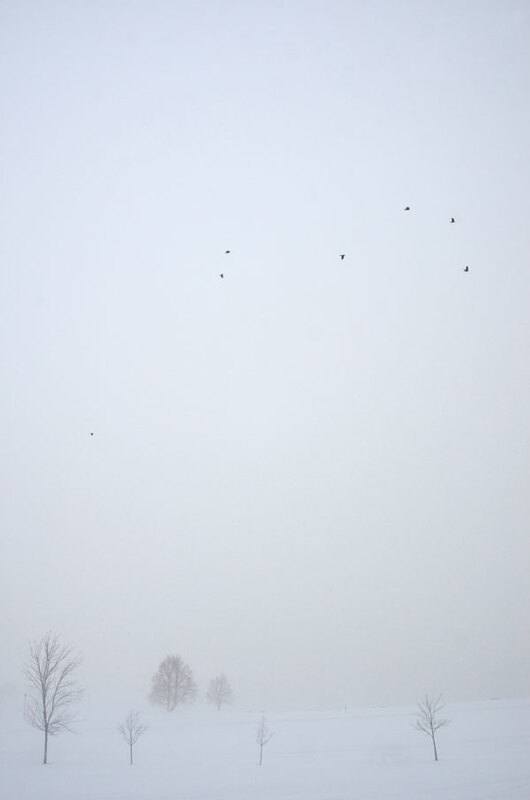 There is the impression that there is something beyond the fog; the birds see it but we don’t see it yet. I really like fog photos Karen, well done! A whole long story in one photo! Beautiful. Love the subtle light in the distance too. Thank you, Hanneke. The subtleties always draw me in. The almost nothingness speaks volumes. Almost nothingness- I like that description. The mind was absorbed in nothing and everything = What a peace ! True, Yoshizen – it was quite peaceful. Glad to hear it, Bente! Magic realism in the visual arts. Stunning. A small moment I was happy to observe. There’s airbrushed, and then there’s SNOWbrushed… Lovely shot! This is what I look for, Karen…wonderful…inspiring, truly. Much thanks, Scott. I’m glad you find it so. Your photograph is magnificent. As someone still learning photography, I am astonished at your work. I was proud of my winter images until I saw yours. I realize how very far I have yet to go, to learn. You are a master artist. Patricia, your comment is very generous. Thanks ever so much! It is a wonderful journey to be on, best wishes with your work. Thank you, Belinda! His work is very intriguing – I appreciate you passing on this link. What a wonderful shot, Karen! It’s like a fairy tale that’s crossed over from the imagination into life. Quietly stunning. One of those rare moments of being in the right place at the right time. Thanks very much, Richard. so simple and stunning. I have been away awhile- i have missed your posts. so beautiful Karen! Take six trees, add seven birds… sound like the beginning of a magic spell. Lovely. Thanks, Alessandro. It seemed a bit like a storybook moment. It was oddly warm the day I took this, actually. A no-glove day mid-winter. Perhaps cold by your standards! What else to add? All the above – a great moment captured! In your title, were you playing off the phrase “at sixes and sevens”, meaning ‘in a state of confusion or disagreement’? Yes, A little intended word play. It was strangely unseasonably warm this day. A deliciously spare image Karen. I see a real similarity to pen and ink drawings here. So nice. Your work is consistently so good. Consistently. This one is especially captivating. My eyes are dancing about due to the excellent composition and the ‘identities’ of the individual trees. Ashley, thank you very much. Sincerely. I love it when someone really is pulled into an image. This makes my imagination flip flop. I love this. It’s just perfect. Thank you, Marina. It came together rather unexpectedly. I’m glad you like it! I’m over at my place, typing away, and then I remember to look up and when I do, I come over here to your place and find the most wonderful, magical things to see. (I get so wrapped up in my own thing I forget how beautiful it is out there/here!) I love the way this one is framed. It makes the world look so tiny, which seems counter-intuitive for a long shot. Why is that? Hi Anna, I think the world looks so tiny because when taking this I was standing at the top of a hill and looking down. Also, I think the lack of detail probably helps. I’m glad you like it – the birds are crows! Such a beautiful composition. The white space really gives it room to breathe.